“The recent allocation of €0.5m funding for the Atlantic Economic Corridor(AEC) initiative, via the Western Development Commission, is fitting endorsement for a development model that is now recognised as the mechanism to harness the economic capability of the entire western seaboard and position it, in the medium to long term, as a realistic counterpale to the burgeoning east coast,” said Shannon Chamber CEO Helen Downes when reviewing the Chamber’s 2018 activities. Outlining the progress made since presenting the concept to An Taoiseach, Leo Varadkar, in January, and its inclusion in the Ireland 2040 National Planning Framework, Ms Downes said that AEC officers are now in place in 7 out of 10 AEC counties with the rest scheduled to be appointed in early 2019, with the Government providing an additional €0.3m funding to support the work of the SAEC officers. “While the inclusion of the AEC in the National planning Framework is a very positive step, carrying this through to the Regional Spatial and Economic Strategies (RSES) and interlinking the Southern and Northern and Western Regional Assemblies’ strategies is the next logical step, as the need for an overarching economic vision is needed to underpin the RSES. This would ensure that key assets such as Shannon Airport, Shannon Estuary, and the Shannon enterprise base are seen as critical to future growth with spatial planning and infrastructural investment as enablers for achievement of economic impact. “The current methodology of putting the spatial plans first inevitably leads to disjointed economic planning and reinforces the existing concentration of economic activity in the greater Dublin area. Economic baseline analysis has to lead our future planning at a regional level; this evidenced-based approach to the development of policy and planning will be adopted by the AEC along the entire corridor in 2019,” Ms Downes added. Turning her attention to the year ahead, Ms Downes stated: “The publication of the National Planning Framework (NPF) in 2018 and the clear intention demonstrated therein to create a realistic alternative to Dublin showed a determination to shift long-held patterns of working within regions rather than across regions. The proof will now be in the delivery of these plans and this is something we, as a Chamber, and in conjunction with other key stakeholders, will be making a contribution to in terms of our commentary on the recently published Regional Spatial and Economic Strategies (RSES) and our involvement in the compilation of the Mid-West Enterprise Action Plan for Jobs. “Brexit will also present a challenge to the region, not just in relation to how businesses reposition themselves for changing trading conditions but also regarding air connectivity to a central European hub in the case of a hard Brexit. The fact that Shannon’s connectivity to Europe is currently served via London Heathrow will need to be addressed and a mechanism put in place to enable Shannon Airport to develop alternative European hub connectivity. 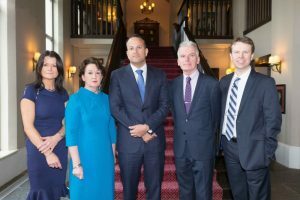 Our role as a Chamber is to ensure that Shannon and the region is not disadvantaged in any changing economic conditions for the country as a whole and we will be working closely with Shannon Airport to ensure that Shannon does not lose central European hub connectivity post Brexit. “Shannon as a living and working town will also be high on our agenda. The recent funding setback for the Shannon Venue project, which has been widely supported by long-standing businesses in the town, concerns us. We hope that discussions between the voluntary committee that has worked on this shovel-ready project for the past seven years, and Clare County Council, will result in a new positive disposition to the delivery of a civic and community amenity for the town, which is glaringly missing from the town’s overall amenity infrastructure. “Shannon’s recent success in being selected as ‘Regional runner-up’ in Bank of Ireland National Enterprise Town Awards 2018 is a fitting tribute for a town that contributes so much to the regional and national economies. The judges’ description of Shannon as having ‘an extensive range of top-class and world-leader enterprise that are at the cutting edge of innovation’ is evidence of Shannon’s standing as a dynamic investment location. However, the judges’ comments that ‘Shannon needs ongoing investment in landscape and presentation as a unified metropolis’ points to the need for a centralised civic and amenity centre as the focal point to take Shannon to a new level. Welcoming this week’s announcement of a €27m fund to upgrade flood defences at Shannon town, the airport and the Free Zone, Ms Downes added: “This is a significant development for Shannon. The airport, businesses and residents can now plan with confidence in the knowledge that Shannon is a safe location in which to invest, with no fear of the immense devastation that flooding can cause. “The many attributes of the Shannon Estuary Way, which is a loop of the Wild Atlantic Way with Shannon Airport as the natural start and finish point for international visitors, and the potential of the river walks in Shannon as tourism products can also now be explored and developed with confidence. The potential to include provision for walkways and cycleways along the estuary as part of the flood relief works and extend the existing walkway over the last 1km to Bunratty is something Shannon Chamber will be keen to see happening,” added Ms Downes. In issuing this End-of-Year statement, CEO Helen Downes complimented the Chamber’s 300 member companies for their commitment to Shannon and the wider region, adding: “Our annual strategy is formulated and driven by our members’ needs. The interactive two-way feedback model we deploy in linking with our membership base enables us to keep our fingers on the pulse as to what to deliver, what to lobby for and the improvements we and this region need to make to pave the way for new investment, additional tourists and an amenable living environment. “Members are at the heart of our organisation”, Ms Downes concluded. 42 training programmes delivered to 613 executives in 139 member companies by its training network, Shannon Chamber Skillnet. 6 Lean-focus workshops hosted by the Mid-West Lean Network as well as the 2nd annual Mid-West Lean Network Conference held at the University of Limerick; this included the inaugural Mid-West Lean Network Continuous Improvement Award 2018, sponsored by LBS Partners and won by Virgin Media. A leading player, via its director Kevin Thompstone in the Atlantic Economic Corridor (AEC) Taskforce, and via its CEO Helen Downes, a lead contact in the AEC Communications process, resulting in the inclusion of the AEC initiative in the Government’s National Planning Framework. The establishment of 2 new business Forums to focus on the Retail and the SME sectors. A first-ever Corporate Social Responsibility (CSR) event to link givers and receivers of corporate assistance – via financial support and executive manpower hours. 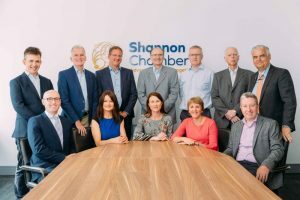 2018 saw Mary Considine, Deputy CEO, Shannon Group assume the role of President of Shannon Chamber; Ms Considine succeeded Julie Dickerson, CEO of Shannon Engine Support. The selection of Ms Considine as President was a natural progression in her tenure as a board member. Other board changes included Stephen Keogh, managing partner, Keating Connolly Sellors being selected as Vice President and Eoin Gavin, managing director, Eoin Gavin Transport joining the board. 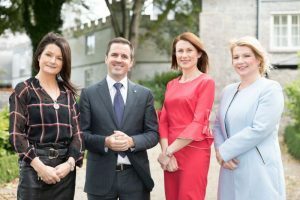 In line with its establishment of key Forums such as the Mid-West Lean Network, the HR Forum and the CEO Forum, which enables the Chamber to give greater focus to areas of interest to members, a new Transport Committee, chaired by Mark Nolan, managing director, Dromoland Castle Hotel, was established. A key barometer of Shannon Chamber’s impact is the extent to which it assists and enables its 300 member companies to strengthen their operations and embed their sustainability. Over 2,000 executives attended the wide range of seminars, breakfast briefings, business lunches and social events organised during 2018; each event providing an invaluable opportunity to members to network and forge new linkages for their businesses. 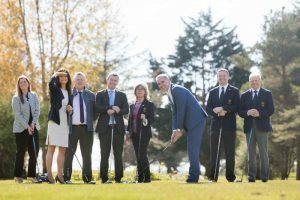 Keynote speakers at the Chamber’s 2018 luncheon series included An Taoiseach, Leo Varadkar; Minister Eoghan Murphy, Martin Shanahan, CEO, IDA Ireland and professional golfer Paul McGinley, whose presence in Shannon in advance of the 2019 Irish Open was welcomed by the business community. A new structured week-long Transition Year (TY) programme was launched in February. This programme, which was led by Molex in conjunction with Shannon Chamber and involved Intel, Lufthansa Technik Turbine Shannon, Reagecon, Chemifloc and Zimmer Biomet, saw 12 students – 7 boys and 5 girls – from St Patrick’s Comprehensive School in Shannon; St Flannan’s Collage, Ennis, St Clements College, Limerick, Scoil Ruaine, Killenaule, Co Tipperary, and Carndonagh Community School in Donegal – partake in the first programme of its type to be offered to TY students by Shannon companies. This pilot initiative was rolled out as the first initiative of a newly created brand called STEM Shannon, which was created to put the spotlight on science, technology, engineering and maths as a career option, and to encourage a greater take-up of these subjects by students as they progress to their third-level studies. A detailed daily programme saw the group spend the first two days in Molex and the third day in Intel, before breaking into separate groups of 6 to move between Lufthansa Technik Turbine Shannon, Molex, Reagecon, Chemifloc and Zimmer Biomet, gaining a cumulative 5 days’ work experience overall. The comprehensive programme involved briefings, interactive games to test their students’ engineering skills, plant tours, demo workshops, meetings with the different types of engineers in companies, labs’ demos, lab testing and chemistry experiments, giving the students an all-round appreciation of the scope of engineering. The success of this pilot imitative led to the delivery of a second structured STEM TY in November. 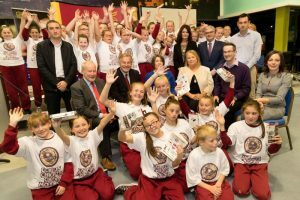 The feedback from the schools and students was very positive and, with some tweaks, a new programme for delivery in 2019 in now at planning stage. Over 160 students and their parents attended the first Apprenticeships’ evening organised by Shannon Chamber in St Patrick’s Comprehensive School in Shannon. The purpose of the evening was to encourage students and their parents to embrace apprenticeships as a career route and to show that there is a way into work that suits students of all aptitudes. 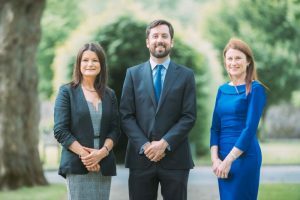 Shannon Chamber Skillnet, which is one of 65 learning networks established nationally by Skillnet Ireland to support and work with businesses in Ireland and their employees to address their current and future skills needs, delivered 42 training programmes to 613 executives in 139 member companies in 2018. This brought the cumulative total in its first three years of operation – September 2015 to December 2018 – to 133 training programmes delivered to 1,502 executives in 385 member companies, and training provided to 45 unemployed people. Operational since September 2015, the Network is now recognised as a very credible training network in the greater Shannon area and by its lead organisation, Skillnet Ireland, resulting in it being allocated funding, in October 2018, to deliver an even more comprehensive programme in 2019. 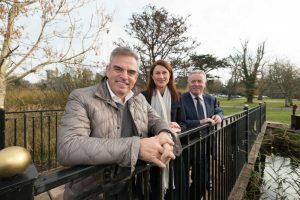 With a programme of training for 2019 now being formulated, Shannon Chamber encourages companies to avail of this invaluable source of funding, which is available to help companies grow and embed new skills within their organisations. The success of Forums already set up within the Chamber – the CEO Forum, the HR Forum and the Mid-West Lean Network – and the linkages that have been created through them, prompted Shannon Chamber to identify areas that might benefit from greater collaboration. This resulted in the established of two new Forums – the SME Forum and the Retail Forum. When fully operational, the SME Forum will examine ways in which it can assist the indigenous industry base address areas such building talent pipelines and addressing skills shortage, creating business spotlights, offering training and instigating beneficial collaborative linkage opportunities for SMEs. The Retail Forum, while still in its infancy, will seek to address the many issues affecting retailers as they face increasing competition from online shopping trends. Areas identified for consideration include digital training and creating a community and a retail platform. Further work on developing this Forum will be undertaken in 2019. The Mid-West Lean Network has seen a substantial growth in membership since its establishment in late 2016. While some of the 100 member companies are proficient in lean, many joined to become familiar with the concept and learn from the monthly workshops hosted by Shannon Chamber. The 6 lean-focused workshops held during the year and hosted in network members’ facilities – Atlantic Aviation Group, Zimmer Biomet, Essilor, Virgin Media, Element Six and in the Gateway Hub at Shannon Airport House, sought to encourage an even greater appreciation for and take-up of lean principles and processes. Linkages with state organisations, IDA Ireland, Enterprise Ireland and LEO Clare, has ensured that the structure of each workshop is meaningful to companies at all stages of development and in multiple sectors. 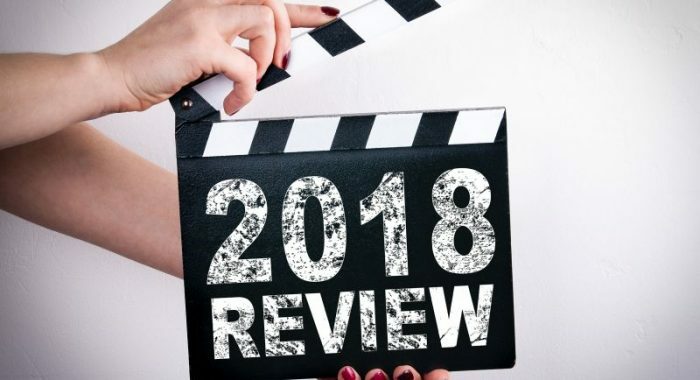 A new Continuous Improvement Award was introduced in 2018 to give companies new to lean the opportunity to gain recognition for their work. Entries were judged on the level of innovation driving the lean project submitted, the Continuous Improvement tools deployed, the level of collaboration, the benefits achieved and their sustainability and the company’s overall commitment to lean. The winner, Virgin Media was announced at the 2nd annual Mid-West Lean Conference held in the University of Limerick in November, attended by over 150 delegates. Commenting on the success of Shannon Chamber Skillnet and the many Chamber Forums now in place, Ms Downes commented: “The success attained to date by each of these Forums and Networks is due to the attention to detail and the steerage of each Chair, whose contributions are voluntary and delivered for the betterment of member companies. Each Chair – Edmund Jennings, managing director, the CREGG Group – Chair of Shannon Chamber Skillnet Steering Group; Claude Costelloe, general manager Zimmer Biomet Ireland – Chair, Mid-West Lean Network; Derek McKay, managing director, Adare HRM – Chair, HR Forum; Kevin Thompstone, managing director, the Thompstone Group – Chair, CEO Forum – has played a key role in driving the success of their respective groupings. In line with Chambers Ireland strategy to encourage companies to become actively involved in giving back to the communities in which they operate and prompted by the low level of entries from the Shannon region for Chambers Ireland annual CSR Awards, Shannon Chamber hosted its first-ever CSR evening at Shannon Airport in October. The purpose of the event was to bring the ‘givers’ and ‘receivers’ of support, financial or otherwise, together. Research undertaken by Shannon Chamber in advance of the event found that 19 local, 14 regional, 16 national and 2 overseas charities or projects currently benefit from the CSR being undertaken by companies in the region; this is expected to increase as a result of this event, which will be repeated in a different format in 2019.